B U B B L E G A R M: 2 Things! I purchased 2 makeup related items today. I hate it when everything runs out at the same time! I was out of under eye concealer. 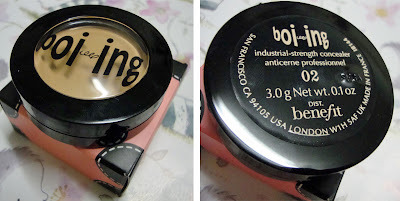 My all time HG is the BeneFit Boi-ing.I use shade '02'. Read my review HERE. I also like the creamy concealer Bobbi Brown do and that's about it. My Chanel Exceptionnel mascara has become crusty and needs to be binned. 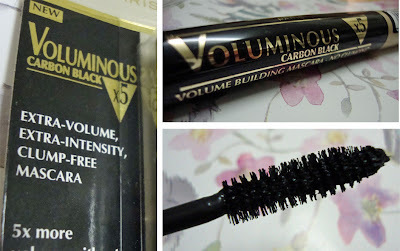 I wasn't willing to splurge on a high end mascara so I purchased a cult favourite 'L'oreal Voluminous' in carbon black. Sounds good, never tried it before, so this will be interesting. What's your favourite under eye concealer and drugstore mascara? Dermacolor makes the best concealers! Also there's a lot of hype about the Amazing Concealers these days however aint tried those yet! I like MAC select cover up for my undereyes. The fluid formula is perfect for blending. For mascara, I am in love with Maybelline Define-a-Lash. L'Oreal Extra Collagen would be mine! I love it! For under eye's I am currently loving Lise Watier Colour Wheel. The medium one is the perfect match. Thank you for posting this! I have been wondering about Bo-ing! Maybe I will go ahead and get it based on your rec. Have you tried the Erase Paste? My fave drugstore mascara is Maybelline Define-A-Lash in the hot pink tube. Loreal Voluminous is a great drugstore mascara, its a really good buy.I have never tried Benefit Bo-ing but I've heard it's good. I just tried the BB Creamy Concealer kit and I really like that. i dont know how carbon black is treating you but i used both the original and carbon black intense before and i liked the original one much much 1000000x better . but im asian and have the typical asian lashes so it might be completely different for you .. let us know how it is !! my favourite under-eye concealer is the bobbi brown colour corrector (light peach, for me). Right now the concealer I'm using is Benefit's Erase Paste however I would really love to try this one! As for mascara-drugstore=handsdown, CG lashblast. Concealer - I'm loving MAC studiofinish concealer (I'm NC 35) and my fave drugstore mascara is L'Oreal Panoramic Curl. It really thicknes and curls. I'm currently using Maybelline full n' soft - because it wipes off easily - so I don't feel guilty about using it frequently. I've been wanting to try L'Oreal Voluminous for a while...I love Chanel mascaras too but they're just a bit too expensive :( My favourite bargain mascara is Max Factor Max - love it! For undereyes I love Touche Eclat...have yet to find a budget one that I like as much! i have afew fave mascaras: YSL faux cils, loreal voluminous and max factor false lash effect mascara. Favourite under eye concealer is Bobbi Brown's Corrector (Light Bisque) and then Warm Ivory Creamy Concealer over the top. Both are so smooth and creamy and cover really well, and are not drying at all. Favourite drugstore mascara is Max factor's False Lash Effect in Black, although I am always looking for something better! I love both of those things, voluminous is my fave drugstore mascara ever!